Each July 4th, thousands of people, most often children and teens, are injured while using consumer fireworks. Despite the dangers of fireworks, few people understand the associated risks—devastating burns, other injuries, fires, and even death. Fireworks are no joke. They are not toys and should not be handled by children or even by untrained adults. However, if you (adults) are determined to use fireworks, you must put your safety and the safety of those around you above all else. 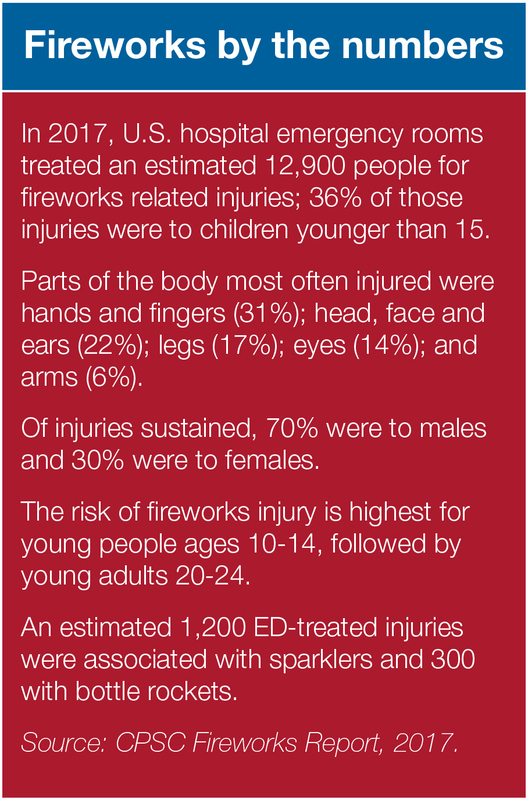 An estimated 8,000 fireworks-related injuries were treated in U.S. hospital emergency departments during the one-month period between June 19 and July 19, 2015. There were an estimated 1,900 emergency department-treated injuries associated with sparklers and 800 with bottle rockets. Always have an adult supervise fireworks activities. Parents don’t realize that young children suffer injuries from sparklers. Sparklers burn at temperatures of about 2,000 degrees—hot enough to melt some metals. More pets go missing on July 4th than any other day of the year. The days surrounding the holiday are the busiest at shelters because many pets get scared of the loud noises and strange burning smells and run off. Also, the additional people at holiday barbecues, leaving open doors and/or gates, can contribute. Even indoor cats who have never run off can go missing. So pay close attention to your pets. Be sure you check all gates and doors throughout the day. 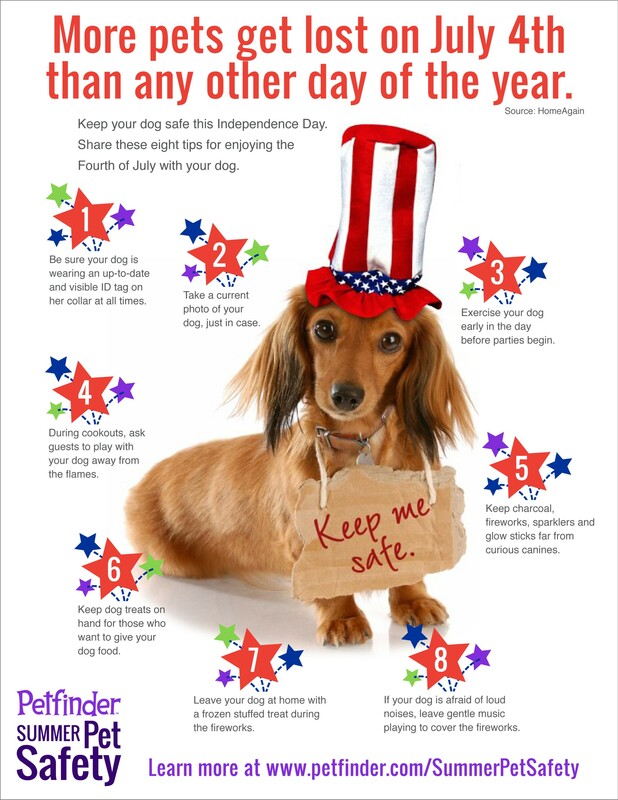 Don′t allow your pets near any fireworks, candles or foods they shouldn′t eat. And always have a safe place for them to retreat, away from the noise. Piñatas … You can purchase or make your own colorful paper-mache piñatas, filled with red, white and blue confetti and candy! Confetti-filled balloons … fill balloons with red, white and blue confetti and let the kids pop them. Glow in the dark toys and bubbles … great for after dark with no worry about fire. Confetti poppers … again, incorporates the red, white and blue colorful display with a popping noise. Noisemakers … always a hit! Remember, fireworks can be dangerous, causing serious burn and eye injuries. You can help prevent fireworks-related injuries and deaths. 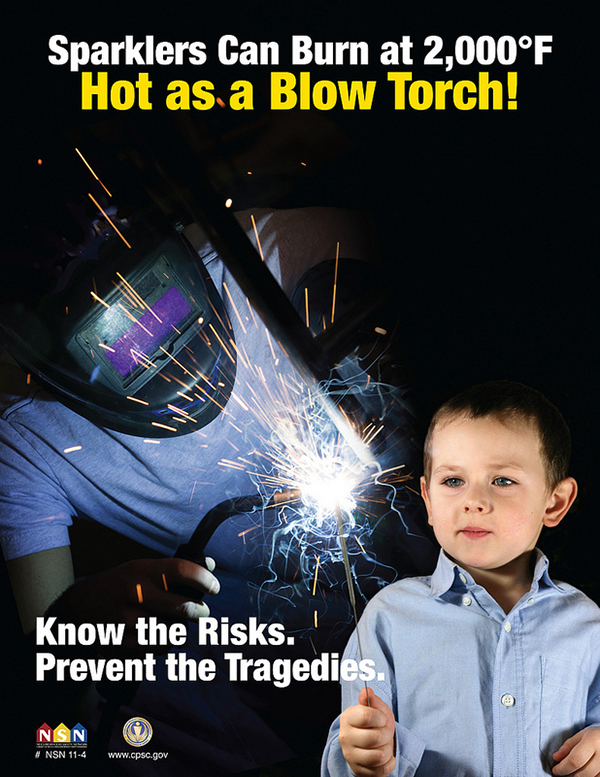 By spreading the word and practicing safety at your next holiday barbecues. Sources: National Council on Fireworks Safety, Consumer Product Safety Commission, National Fire Protection Association, Petfinder, Safe Kids and Protect America. 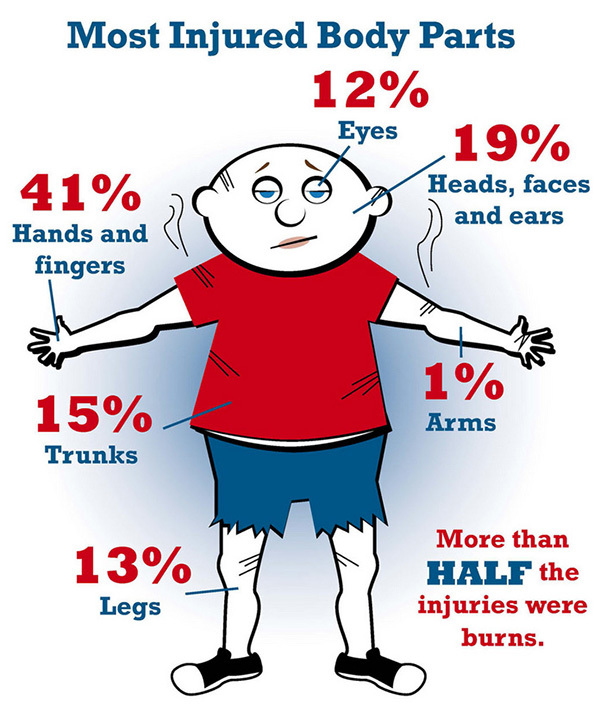 The U.S. Consumer Product Safety Commission reports that approximately 16 percent of all consumer fireworks injuries are caused by sparklers burning hands and legs. Young children account for the majority of sparkler injuries. Little arms are too short to hold sparklers, which can heat up to 2,000 degrees Fahrenheit. As disappointed as they may be, do not let children younger than 12 hold a sparkler. They often lack the physical coordination to handle sparklers safely and likely will not know what to do in an emergency. Let your young children use glow sticks instead. They can be just as fun but they don’t burn at a temperature hot enough to melt glass. Close supervision of older children is necessary. Never hand a lighted sparkler to another person. Give them an unlit sparkler and then light it. If a youth is holding the sparkler, have an adult light it. Only light one sparkler at a time and hold one sparkler at a time. Those using sparklers should stand at least six feet away from each other. Never use a sparkler when sitting down or holding a child. Be aware that sparks can ignite clothing, so avoid loose fitting clothes that could catch fire. The sparkler wire stays hot long after the flame has burned out, so drop the used sparklers directly in a bucket of water.